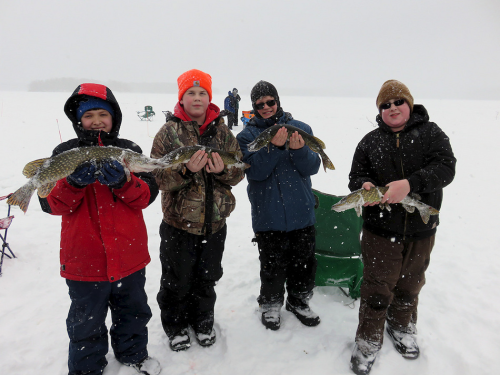 Boy Scouts from DeKalb’s Troop 33, sponsored by First Lutheran Church, braved the winter cold for an exciting ice fishing adventure. They traveled 400 miles north to Lac Dieux Desert, a giant 4,000-acre lake, which covers a portion of the Wisconsin/Michigan border. There they learned some of the fun and rigors of ice fishing from professional guides. Scouts and leaders based themselves for the day in a central location on the lake outfitted with a windbreak tent, cooking grill, snowmobiles and sleds. The ice on the lake was more than 10 inches thick. Fishing guides explained and demonstrated the boys needed to know before ice fishing. More than 40 fishing sites had been selected where fishing-holes were drilled with power augers. Each fishing-hole was equipped with line, hook and bait and connected to a tip-up device identified by a bright orange flag. If a fish took the bait at a tip-up, the orange flag would pop up signifying there was a fish. An adult with boys would quickly respond by snowmobile or run to the tip-up site. Sometimes multiple flags would pop up at the same time sending Scouts responding in different locations. Responding to a flag pop up at a fishing-hole could produce different results, such as pulling up a snag of weeds, a fish escaping, or the best hoped result of catching a large fish. Luckily, the fish were really biting that day and keeping boys plenty busy. They caught northern pikes, crappie and perch with the total day’s catch numbering 45 fish. The largest fish of the day was a tie between two 28-inch northern pike. Of the fish caught, 34 were released back into the lake and 11 were kept for a fish fry later that night. As daylight came to an end, Scouts collected gear and moved off the lake. Even off the lake there was still plenty of work to do. The task of cleaning all those fish required a lot of hard work and delicate skill. Scouts received training and valuable experience under the guidance of experienced adults. The return to DeKalb included a stop at Cave of the Mounds near Blue Mounds, Wisconsin. Scouts enjoyed some underground adventure and education as they explored the cave and learned lessons about geology and cave formation.